♥ i heart craft ♥: Katies having a baby!!!! My Little sister is having her first baby in less than 8 weeks! So we are throwing her a baby shower! 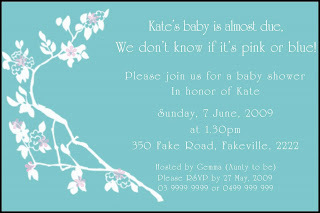 Her nursery is tiffany blue with a cherry blossom theme, so I themed the invites around that of course!